As a devious gambling tycoon in the film Runner Runner, Ben Affleck knew a thing or two about how to ensure that the house always wins. In real life, however, the Oscar-winning actor appears to have turned the tables on the casino industry, taking the Hard Rock in Las Vegas for hundreds of thousands of dollars through the legal but frowned-upon practice of card-counting. “You’re too good at the game,” Hard Rock security managers are said to have told him as they escorted the actor from the blackjack tables and found him and his wife, actress Jennifer Garner, a cab back to their hotel. It was not the first time that Affleck – an accomplished gambler and one-time contestant in the World Series of Poker alongside fellow screen star Matt Damon – has been accused of underhand practices at the card tables. In 2011, he was named in a lawsuit as being one of several Hollywood A-listers who were members of a clandestine gambling ring in California. Fellow members included Tobey Maguire and Leonardo DiCaprio, the lawsuit alleged. Affleck, a father of three, caught the attention of casino officials during what was to have been a low-key get-away with his wife prior to him settling into filming of the highly anticipated “Batman vs Superman” movie. He was “backed off’ by Hard Rock officials – a term used when a player is evicted from blackjack but still allowed to take a hand in other games – after they observed him allegedly employing “perfect basic” – a beginner’s method of card counting. Card counting is a mathematical strategy that can be used by players to bet bigger sums at less risk, by keeping a running tally of the distribution and location of certain cards over a number of games. It is not illegal, though the use of devices, or of signs and signals between players, to compile or communicate the information, is. There is no suggestion that Affleck had devices or accomplices. “Just having a brilliant mind counting cards is fine,” said James Taylor of the Nevada Gaming Control Board, though the practice is not tolerated by casinos for the financial advantage it affords gamblers. A warning circulated to other Las Vegas casinos on April 29 on a system known as the Surveillance Information Network, stated that Affleck was “suspected of advantage play,” according to Star magazine, which claimed to have obtained a copy. 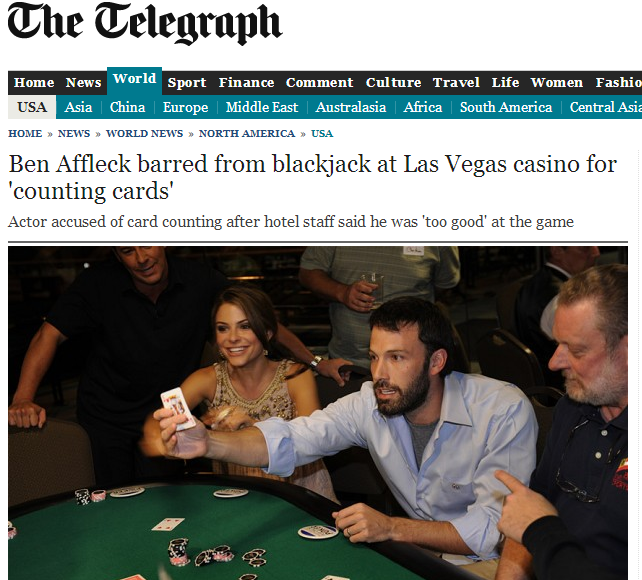 A similar alert had also been issued days earlier, stating that Affleck had been spreading bets of up to $20,000 a time on ‘shoe games’ of blackjack, according to the magazine. Shoe games involve as many as six decks of cards. “Putting out a spread of that much is absolutely unheard of and absurd,” a Las Vegas insider told Star. Posted on May 5, 2014 by richluscombe. This entry was tagged ben affleck, las vegas, sunday telegraph. Bookmark the permalink.